This week the United States Patent and Trademark Office (USPTO) issued 6,775 patents. Each patent is important as it adds something new to the human knowledge base. The PatentYogi team selected eight of the coolest patents granted this week. NASA has patented a rover that looks and moves like the jelly monster Blobby from Hotel Transylvania. The rover is essentially a bladder filled with a fluid containing shape memory polymers. The bladder is covered with an outer layer that bladder from dirt or debris of the surface or surrounding atmosphere. Fingers (or bumps) are also provided over the outer surface to enable the rover to grip the surface and facilitate movement. By selectively energizing the shape memory polymers at a designated part of the bladder to alter its shape or size causing motion of the designated part. Another technique used by the rover to achieve locomotion is by directing motion of the fluid within different parts of the bladder. A valve assembly draws fluid from a compartment and discharges it into a designated compartment to displace the designated compartment with respect to the surface. The bladder may also include elongated flexible tubes filled with ferro-fluid and a moveable electromagnet. By energizing and de-energizing the electromagnet, the flexible tube can be lengthened/shortened in the direction of motion, allowing the rover to move along the surface like a worm. Google has developed an ocean-going vessel which uses seawater and green energy as inputs and extracts carbon dioxide from seawater while also producing jet fuel as output. The vessel applies electrolysis to seawater to produce hydrogen gas. A refinery system then produces jet fuel from the hydrogen and carbon dioxide that is extracted from the seawater. An aerial vehicle tethered to the vessel flies in a circular or ellipsoidal path in order to convert wind energy into electrical energy. The electrical energy is then relayed to the vessel via the tether where it powers the electrodialysis and refinery system. The aerial vehicle could also serve as a propulsion system for the ocean-going vessel, pulling it through the water. By deploying a large fleet of such vessels the health of the ocean can be drastically improved and possibly even reverse climate change by increasing the ocean’s ability to absorb carbon dioxide from the atmosphere. The robot is capable of running at high speeds using rotating legs. One motor is used to provide torque to a leg assembly while another motor allows the user to steer the running robot. A remote control enables a user to control both throttling (acceleration) and steering. In order to provide stability, the majority of the weight of the robot is located below the axis of rotation of leg assembly. This keeps the center of mass of the system relatively low and below the axis of rotation. Applying torque between the center of mass and the hub allows for power and steering. When a potential missile attack is detected, an airborne balloon deployed at a higher altitude suspends a curtain around the ship like a matador’s capote. The curtain is deployed across a path identified as a potential attack path for an incoming threat. When the curtain is impacted by an incoming cruise missile, a portion of the curtain separates from the remaining portions of the curtain and enwraps or entangles the missile. Covering the flight control surfaces deprives the missile of lift, preventing relative air movement over the flight control surfaces. When deprived of lift, the missile falls due to the force of gravity and strikes the surface before the missile is able to reach the intended target. Novartis has patented a contact lens capable of automatically focusing on objects. The invention uses sensors that pick up electrical signals from the ciliary muscle of the eye responsible for focusing. The signals are then used to control electro-active optics such as liquid crystals deposited on the contact lens. The optical power of the contact lens is thus adapted according to the viewing intention of the wearer to focus on near objects or far objects. The contact lens can also switch between near and far field vision based on a cue provided by the wearer such as a blinking pattern of the eye. To simultaneously refuel two or more receiver aircrafts, multiple wing pods are mounted to a tanker aircraft. Each wing pod contains a refueling hose and a refueling drone. The refueling drone can be extended rearward such that the refueling drone is towed behind the tanker aircraft by the refueling hose. 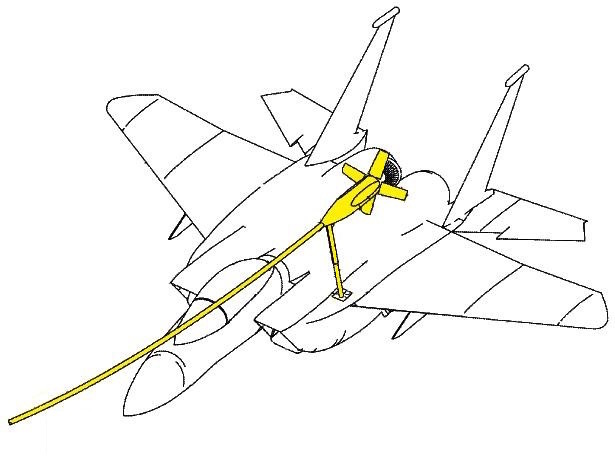 The refueling hose is of a relatively long length to allow for increased relative movement and spacing between the tanker aircraft and the receiver aircraft during refueling. Additionally, the refueling system can be retracted and stored internally in the tanker aircraft to minimize aerodynamic drag and increase stealth capability of the tanker aircraft. Ebay has patented a 3D printing marketplace. In the proposed marketplace, 3D printing service providers compete to fulfill requests for 3D printing tasks. Participants such as CAD designers, manufacturers, engineers and users can upload designs into the marketplace. The participants can select a printing option from an array of available 3D printing options. The uploaded designs are then displayed to 3D service providers or users participating in the marketplace. Subsequently, 3D service providers compete or bid to complete a 3D printing task based on the displayed design. The printed object may then be shipped to the consumer. The transportation system is made of an evacuated tube containing a transport capsule which is designed to travel within the tube. The capsule is a light weight structure with a very low drag force which minimizes energy consumption. Cryostats are mounted on the top and bottom of the capsule along its length. Each cryostat is made of an electrically non-conductive housing that contains superconductor elements for use in linear induction for capsule acceleration/deceleration. Further, superconductor levitation force elements are divided between the upper and lower cryostats. A pair of permanent magnetic elements mounted at the top and bottom of the evacuated tube is then used to levitate the capsule. In order to steer the transport capsule, a pair of capsule based switchable diverge force elements cooperate with a pair of tube based diverge force elements. All images courtesy of PatentYogi.